Amodel Aircrafts "5-1" & "5-2"
The Bisnovat 5 (Бисноват 5) was a supersonic research aircraft designed in the USSR in the late 1940s, inspired by the German DFS 346 aircraft that was captured by Soviet troops towards the end of World War II. The Bisnovat 5 was ordered into development to provide an all-Soviet alternative to an aircraft built with foreign technology. Originally intended to take-off from the ground, gliding flights were carried out from a Petlyakov Pe-8 mothership, similar to the way that the Bell X-1 was dropped from a B-29 Superfortress mothership. Unpowered flight tests revealed poor stability and dangerous landing characteristics with 5-1,(first prototype), being damaged beyond repair after the third gliding flight. Flight tests with Aircraft 5-2, fitted with a 45 degree swept fin of greater aspect ratio to improve directional stability, resumed on 26 January 1949, but further delays were caused by the pilot landing off the runway causing serious damage. To improve the landing stability 5-2 was modified with wing-tip skids, at the end of downturned wing-tips with 45 degrees anhedral, and a single skid on the centreline, as well as a ventral fin at the rear. Flying and landing qualities were much improved, but progress was slow and the Bisnovat 5 was cancelled without the aircraft making a single powered flight and only sixteen gliding flights, between 14 July 1948 and November 1949, during which a maximum speed of 0.775M was attained. Despite never having made a powered flight, these two aircraft are interesting and historically significant in the history of Soviet aviation. One can only guess at the bravery of the men who piloted these planes, even in the glide tests. As you might expect, Amodel has used the same fuselage and canopy pieces for both aircraft, providing different sprues for the wings and tail sections. Both fuselage sections have the pylon to which it was attached the the Pe-8 molded in place so those will have to be cut away. For the earlier 5-1 aircraft, the tail will have to be cut away so that the new one can be glued in its place. Both fuselages come with the gear bay doors closed so some cutting will be needed if one wants to portray these on their landing skids. The instructions provide full information on doing this. The kit is quite basic with only a generic seat, instrument panel and stick for the cockpit. 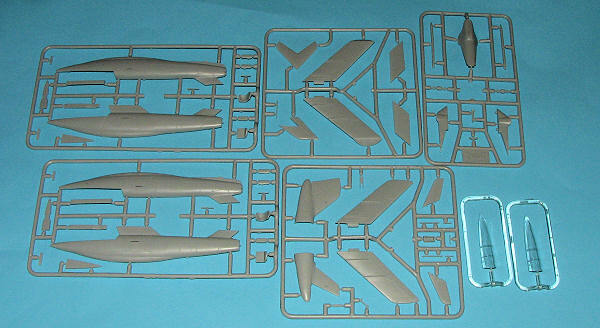 Also included are the proper pylons and an upper fuselage section for the Amodel Pe-8. I'm not sure if the probably superior Zvezda kit will be usable for the Pe-8 part, but apparently one will need the version with the radial engines. Full modification information is provided. Instructions are quite good for this aircraft with very well done construction steps and Humbrol color information. 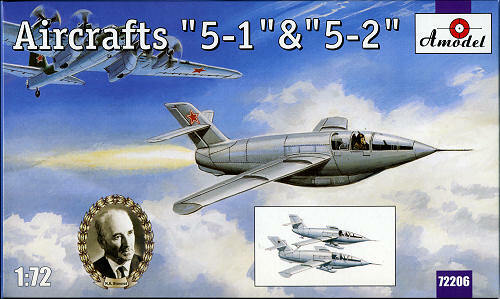 Both are overall light grey according to the painting diagram with only the second aircraft having insignia on the fin. The small decal sheet is well printed and should work just fine. We have to thank Amodel for bringing us this and other interesting and quite esoteric aircraft kits. This is something you just cannot get anywhere else and is sure to elicit commentary when you show them to friends. My thanks to www.scale-model-kits.com for the preview kit. You can get this and many other interesting kits at a discount from the link.